The combination of Chef Pearl Chung Mushroom Soy sauce and Oyster sauce in this recipe, gives it a flavor that one can only experience from being fed by world-renowned chefs. Create this simple recipe on your own&hellip;.in your own master kitchen. Cut beef into thin slices. Soak in marinade mixture (see ingredients section) for at least 20 minutes. Rinse Chinese greens, cut into small sections, blanch in boiling water, remove, rinse under cold water, then drain. Heat 2 tbsp cooking oil and stir-fry Chinese greens until done. Remove and line on a serving plate. Blanch beef through smoking oil, remove, and set aside. Heat 2 tbsp cooking oil to stir-fry ginger until fragrant. Add beef and stir-fry sauce (see ingredients section). Cook well. 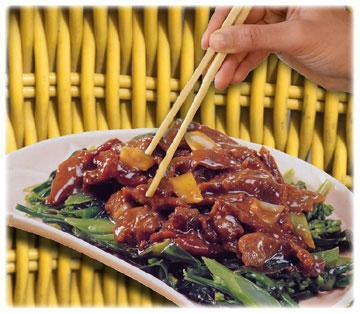 Remove the beef and arrange on serving plate with the Chinese greens.